NYC, 02/28/2019, 1:00PM. 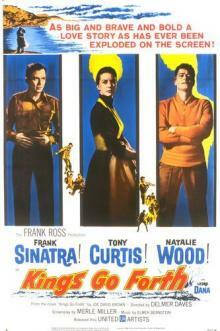 Kings Go Forth (1958): World War II film starring Frank Sinatra and Natalie Wood. 109 min. Director: Delmer Daves. The screenplay was written by Merle Miller from the novel of the same name by Joe David Brown, and the film was directed by Delmer Daves. The Music was written by Elmer Bernstein. It includes Frank Sinatra's song Monique, with lyrics by Sammy Cahn.